TP-LINK TL-WA850RE 300Mbps Universal Wi-Fi Range Extender Review - Best Review by Dan Karas. How do you extend your home network to areas with poor wireless reception? There are multiple ways to do this including running Ethernet cable, wireless extenders, etc. One of the easiest and most economical methods is to use a Wi-Fi Range Extender. 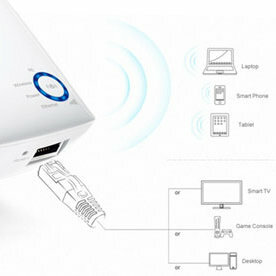 The TP-LINK TL-WA850RE 300Mbps Universal Wi-Fi Range Extender is a convenient and very easy solution. The WA850RE extends your home network wireless range. The way it works is you simply plug the device into a power outlet between your router the area that you would like to extend your WiFi network to. To set up the device, you can use the WPS button If your router supports WPS, otherwise you can use quick setup via a browser-based interface. After the device is configured it will extend your wireless signal to provide WiFi to areas previously unreachable or with poor WiFi reception. Wi-Fi Range Extenders are easy to setup, just plug and play. The extremely affordable TP-LINK TL-WA850RE 300Mbps Universal Wi-Fi Range Extender is currently the number one selling wireless range extender that you can buy at Amazon. The device includes a standard Ethernet port that enables you to connect wired devices such as DVD & Blu-ray players, gaming consoles and Smart Internet enabled TVs to the extender. The TP-Link TL-WA850RE will not speed up a slow Internet connection. If your broadband ISP service is too slow to stream smooth Netflix video then a WiFi Range Extender will not help. You'll need to find a faster Internet provider. However if you have a fast Internet provider but your problem is extending your broadband connection to a area with poor or unreliable wireless signal, then a WiFi Range Extender may provide a simple solution. The speed, performance, features, and good customer reviews of the TL-WA850RE make it a good choice if you're in the market for a inexpensive WiFi Range Extender. 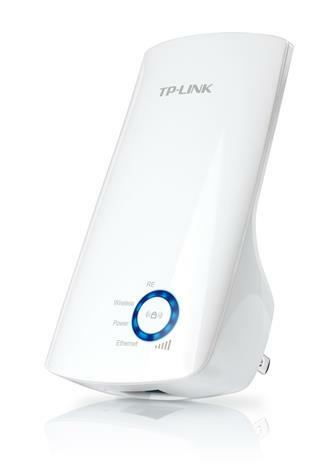 PDF Format - "TP-LINK TL-WA850RE 300Mbps Universal Wi-Fi Range Extender Review"